I thought I would have to wait until next (British) spring for any open water swimming blogs, I was wrong. 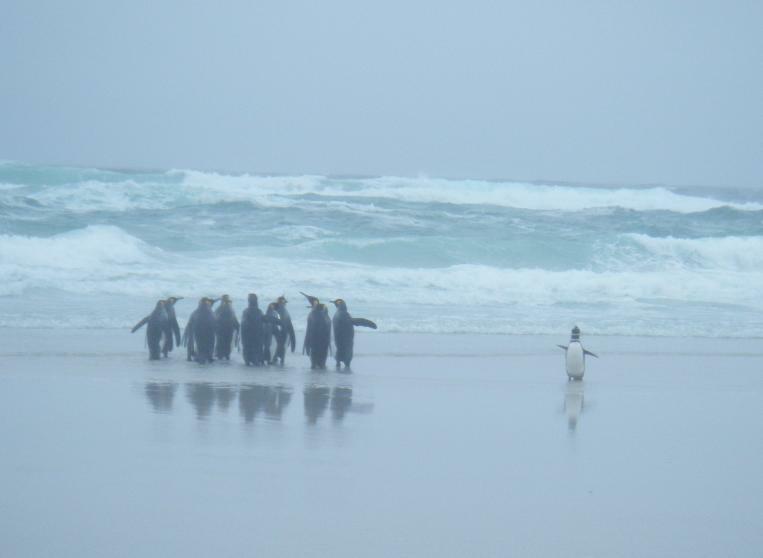 Yesterday I got up close and personal with the South Atlantic in the Falkland Islands. We went on a day trip to Volunteer Point, a 2 to 3 hour drive from Stanley. The main attraction at Volunteer Point is the colonies of three different species of penguins (see previous blog). Penguins live near and in the sea. 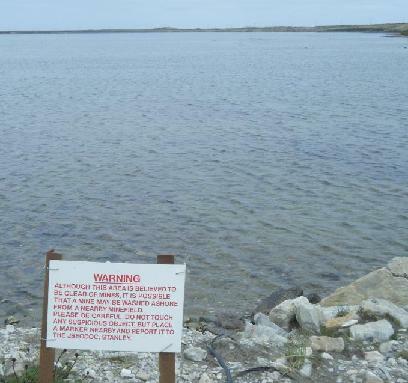 Unlike some of the Falkland Islands beaches the sea access at Volunteer Point is not fenced off as potential minefields! There were two areas where we could access the water, Volunteer Lagoon provided calm waters that could (with the removal of the penguins and addition of a few trees) easily be in the Lake District. The second option was Volunteer Beach, with waves like a north Cornwall beach, 4 to 5 foot breakers. Obviously we chose the latter; the clear green colour of the cold Southern Ocean waters was too enticing. Whilst looking at penguins I was wearing full waterproofs, a ski jacket, hat, gloves and buff. The weather was bleak – foggy and windy. Stripping down to my costume felt ridiculous so we ran across the dunes and down the beach. Amazingly the sea didn’t feel as cold as I was expecting – but there was a strong rip current. It wasn’t just a dip – we played in the surf for a (short) while until I lost feeling in my feet. The sea felt amazing, and the walk back up the beach after was not as cold as expected and provided some good photo opportunities with the penguins! I was very grateful for the radiator in the hut at the top. So the largest King Penguin colony in the Falklands is not the only reason to visit Volunteer Point! As well as swimming I have managed to go on some good runs. From Stanley I went on a 14 km run to see my first penguins at Gypsy Cove, then about the same distance along the sea front the other way the following day. My only complaint is the road surfaces – loose gravel does not make my knees happy. We are now on the JCR in Mere Harbour, part of the military base. Bertha Beach, a few kilometres away, provided an amazing run with dolphins playing in the surf alongside. George V caused global warming? !